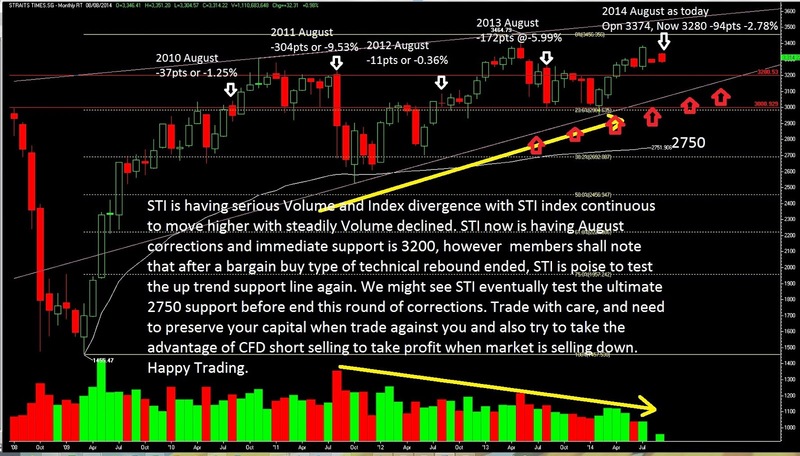 SGX Day Traders: 2014 Aug 08-- #sgxdaytraders view on STI outlook for now and near futures! STI is having serious Volume and Index divergence with STI index continuous to move higher with steadily Volume declined. STI now is having August corrections and immediate support is 3200, however members shall note that after a bargain buy type of technical rebound ended, STI is poise to test the up trend support line again. We might see STI eventually test the ultimate 2750 support before end this round of corrections. Of course STI will not go down in one straight line, Another psychology support is at 3000 and Sgx day Traders will provide members with daily pre-market open stock market debrief and advise the strategies and potential Stocks with complete trading plan to Go long or Short selling. Please contact us if you are our clients and not yet access to our Live Trading webinar. *T&C applied . Trade with care, and need to preserve your capital when trade against you and also try to take the advantage of CFD short selling to take profit when market is selling down. Happy Trading. In this blog every time news update for market and i read this for improve my personal business. all this update help me for my business growth. SGX day trading requires some accurate and best SGX Hot Stock Picks to trade successfully. With some accurate Intraday SGX Signals, traders earn good profit than others. Great description over Singapore capital market and specially on straits time index (STI). I think the post is really interesting for SGX traders to identify whether the market conditions are favorable or not. I 100% agree with you on the point that the fear of failure is something that prevents most of us from reaching the success that is right before our eyes. It might not seem like much, but your articles are really helpful for us who are still going through the huge learning curve without any clear view of a silver lining. It's great to hear your progress and I hope 2016 will be a good year for you. Trade binary options with Tradorax! Our unique trading platform is easy to use for both experts and customers who want to learn to trade. The foreign exchange market (forex) is the largest market in the world for the trading of currencies.